There have been a few things that have happened this summer that have made me quite nostalgic for my grandparents. I think the main event would have been Ken losing his grandmother. Now neither of us have any remaining grandparents. Of all four of my grandparents, I was probably closer to my dad's parents because they lived in the same town as we did for a good while. My brothers and I visited regularly and helped out with mowing the grass and working in the garden. 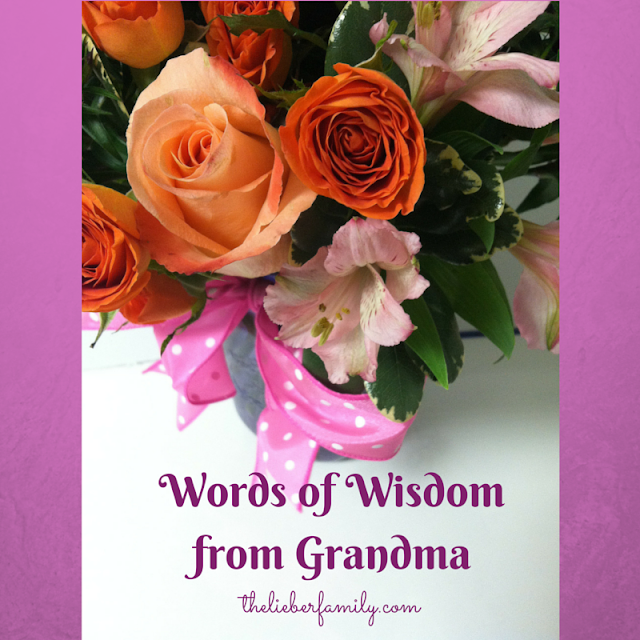 I learned a good deal from my grandmother that I have since began to share with my own children. I'll be honest, hearing my mother's words come out of my mouth was a bit of a shock, but repeating my grandmother's words was an entirely different feeling! "You just have to try it"
We always had to "try it" at Grandma's house. No matter how many times we had attempted to eat that particular food before, we still had to take a bite. I remember hating Brussels sprouts because they were her favorite vegetable and we had to try them so many times. As a kid, I resented that rule; but as a parent I use it myself. I've told my kids that you have to try a new food 27 times before they can decide if they like it or not. There's research that backs that up, though I may have exaggerated the number! A small note for Grandma: I actually like Brussels sprouts now. And so do my kids! I think of her each time we eat them. "You can always take more, but you can't take less"
We've recently started letting the kids serve themselves at dinner. It was getting time consuming for me to serve up all the plates and my food was getting cold. We also discovered that Benjamin is much more likely to try new foods when he puts them on his own plate. Now the kids ask how much they should take. This is a good way for them to learn about portion control and acknowledge how hungry they are. I hear my grandmother's words coming out of my mouth: "You can always take more, but you can't take less." The kids asked me to explain that because it sounded odd. I told them that as long as they eat what they take, I'm happy for them to take as much as they want. However, you can't put food back in the bowl after you've taken it and then it would go to waste. I'd rather they eat seconds (or thirds) instead of wasting food. "Ice cream fills the cracks in your stomach"
I don't say this out loud as often, but I think it. We used to have ice cream after almost every dinner at my grandparent's house. It was often butter pecan or some flavor of fruit sherbet. Any of those flavors bring back memories in my mind. I recall be stuffed fairly often and joking that there was no more room for dessert. Grandma always explained that ice cream doesn't take up any space in your stomach because it melts down and fills up the cracks. I justify my own evening bowl with these words going through my head. My grandmother was born in 1914. She lived in a time when education for girls was not seen as an essential. However, my grandmother not only graduated from high school, she went to college and finished her degree as well. After graduating from the University of Chicago, she became a teacher and spent many years in that profession. By the time she was my grandmother, she was no longer working, but I still remember hearing how important an education would be. My love of teaching, learning, and reading come directly from her and I see it being passed on as my kids bury their noses in books today. Tweet: I am glad that my kids are learning from my grandmother, even if they never got to meet her. Do you have any words of wisdom from your grandparents to share?